Two of the men who helmed Ghost Ship, the Oakland performance space and residence in which 36 died after it burned down in December of 2016, are expected to receive dramatically shorter sentences than originally expected. Leaseholder Derick Almena and supervisor Max Harris will both likely plead no contest to involuntary manslaughter charges on Tuesday, meaning not only will they avoid a trial expected to take place later this month, but their sentences will be reduced to just nine and six year terms in county jail, respectively. Initially, both men were charged with 36 counts of involuntary manslaughter, and faced up to 39 years in prison. According to the East Bay Times, prosecutors argued that both men were criminally negligent. Court documents say that Almena filled the space with “fence boards, shingles, window frames, wooden sculptures, tapestries, pianos, organs,” which accelerated the fire. They also said that Harris blocked off a second stairwell that prevented attendees from escaping. 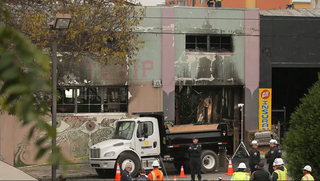 Ghost Ship was home to 25 tenants, despite the lease dictating that it only operate as a commercial space, in addition to the fact that it lacked sprinklers and functioning smoke detectors. In response to the tragedy, Oakland Mayor Libby Schaaf issued an executive order to safeguard DIY art spaces in a city increasingly inaccessible to all but the wealthy, though residents say progress has been halting.